Back acne can be both uncomfortable and unsightly. If you have a special event coming up, you likely want to get rid of your back acne. Thankfully, there are ways in which you can significantly improve your condition fast. If you follow a dedicated treatment regimen, you can likely see improvements within a few days and often get rid of your back acne within a week. Be diligent and care for your back well in order to achieve the best results. Wash your back twice daily, using an antibacterial cleanser. Sweat, dirt and bacteria can all cause and worsen acne. By cleansing your back twice daily, you remove these acne-causing issues. Exfoliate your back, using a loofah and body scrub. Exfoliation treats and prevents clogged pores which exacerbate acne. Aim to exfoliate your back twice per week. Remove clothes immediately after exercising. If you remain in sweaty clothes, it can greatly worsen your back acne. If you aren't able to shower after working out, at least change your shirt. Spread acne treatment cream over your back. Choose a cream that contains benzoyl peroxide, an effective ingredient at combating acne. You can find such creams over-the-counter in most drug stores. Create a paste with equal parts baking soda and water. Apply the paste to your back and let it remain there for 20 to 30 minutes. The baking soda will kill bacteria and absorb excess oil, thereby improving your back acne. Use a deep-cleaning mask on your back. You can use a mask that is designed to be used on the body, or a facial mask will also work. Choose one that contains mud or citric acids which help eliminate acne. Wear loose, cotton clothing. Tight clothing traps sweat and bacteria next to your skin, leading to acne. Synthetic materials don't allow your skin to breathe properly, also causing acne. See a dermatologist. If you have chronic back acne, you may need to be on prescription medication to treat it. Your dermatologist may also be able to give you a cortisone shot to get rid of specific pimples quickly. 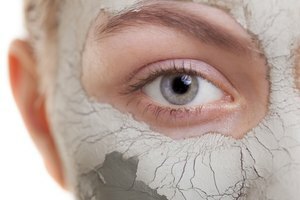 While this isn't a long-term treatment option, it can effectively get rid of acne quickly prior to an important event.